– The owner of a yacht feels happy twice: when he buys it and when he sells it. That is the phrase one of our clients said. Our experts do not know what feelings the owners of penthouses experience when they sell them: pleasure or light sadness. The fact is that people quickly understand that the task of selling such an expensive and exclusive facility is not easy. The owner of a penthouse expects to get a little bit more money in comparison to its market price. It is understandable as he or she invested a part of soul, time, made interior design. The issue is that a buyer does not care about it. A buyer wants to buy a penthouse on real market price without paying extra fees. The project broker who will be responsible for the sale of your penthouse will consider the prices of similar properties in the area that are currently on sale, will evaluate the object itself and offer the recommended selling price. It is already up to the owner to agree or not to list the penthouse at such a price, but there are known over-evaluated lots in the market that are waiting for their owners for decades. If the task is to sell - sell. If you need to amuse self-esteem, it is better to contact other agencies. The photographer of the project comes and just makes good photos. We need them for listing on the website and in the printed catalog of penthouses. Separately, you can make a 3D-tour of the penthouse. We have a special camera that costs 500,000 rubles to film all the rooms in 3D. The result is approximately such a tour. The 3D-tour allows you to less participate in previews with customers who just want to watch. People are even able to walk along the penthouse in special 3D-glasses, which is especially great for customers who do not live in Moscow. The designer of the project draws the layout of the penthouse. The content manager writes a text describing your penthouse and lists it on our kupipenthouse.ru portal. 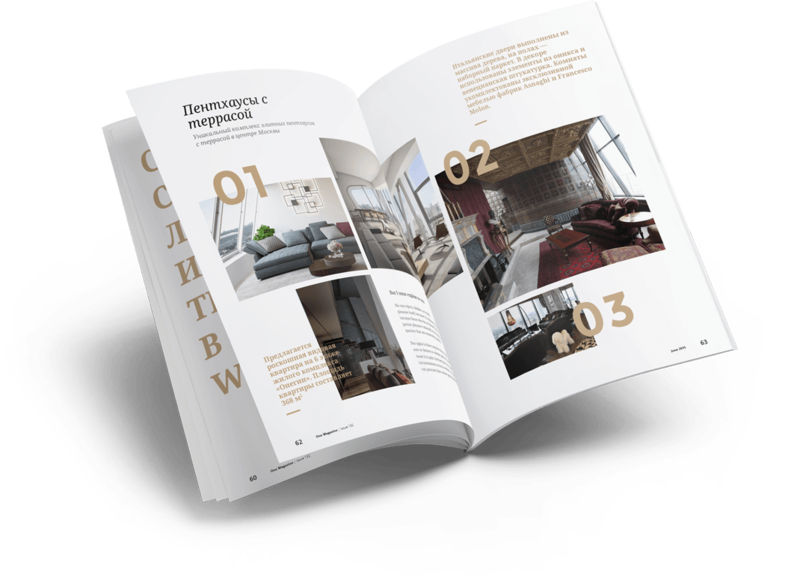 The marketing department of the company constantly runs the advertisement of the project in Yandex and Google at the request "buy penthouse urgently" and others that buyers are looking for. Customers visit the website, and some of them call or download the catalog. A call or an order of a customer is assigned to one of the 7 brokers of the project. Each of them has visited hundreds of penthouses in person and understands the market. We sell, but do not insist on selling. You would not be pleased if you were sold a penthouse that does not suit you, simply because it has to be sold. We are sure that every penthouse has its own customer and he or she will definitely come if there is an adequate price. The broker will coordinate the time of the preview with you and with a client. We ask the owners to help us in the sale and facilitate a fast preview. Be in touch or appoint responsible employees who will always be on the phone. We understand that you also have business, troubles, and a bad mood, but money will be in your pocket faster if you do not delegate or cancel the preview on your own and behave hospitable. Realtors from other posh companies say that it is a bad idea to buy a penthouse in the mortgage. This is not true. They just have not yet learned how to approve loans for this amount of money. There is a mortgage broker assigned to every kupienthouse.ru project. We easily approve the amount of 40-60 million rubles within 3 days, if the clients do not have enough for the right penthouse. The maximum mortgage amount that we approved for a client in 2017 was 160 million rubles. And this is not because our customers do not have money. They just know how to count them. A bank gives a rate of 10.5%. Sometimes it's 11.5% or even 12.5%, but it's still not very expensive, compared to how much live cash values. If a person has a cash and wants to buy a penthouse, we do not impose a mortgage, we sell for cash. The lawyer of the company prepares the contract of purchase and sale and other documents to execute the transaction. The broker appoints the date of signing, organizes a notary and gathers all parties on the desired day and hour. Signature. Payment. Checking in. Your penthouse is sold. The sale of each mansion involves the team of 6 people: a photographer, a marketing specialist, a project manager, a content manager, a broker, a lawyer. They all work for us to get decent money. Before proceeding with work, we determine the amount of the company's remuneration, and you have to immediately pay us this amount after the transaction is over. With the money received, we pay for the work of our team, advertising, which attracts customers and generates profits to the founders. Our remuneration ranges from 2% to 5% of the cost of the property. When the value of the object is very high, a fixed and pre-agreed amount is determined. We do not charge the buyer of the penthouse. If you think it's not fair and not right to pay people for the work described above, then you're just not our client and we will not be able to sell your penthouse. Some owners want to sell their penthouse quickly, and we have a separate paid service called "penthouse-booster" for this purpose. It includes the placement of a mansion in the top block of the main page of the website with best offers and "choice of portal" label. Moreover, we launch advertising on Facebook and Instagram accounts of wealthy clients + contextual advertising of this particular mansion in Yandex and Google. We develop a 3D-tour, and brokers show and offer this penthouse to customers first. The package costs 150 000 rubles and is paid at the beginning of cooperation. One of the main questions a seller has is how much time it takes to sell a penthouse. We can't provide a detailed information on this issue. It will be dishonest to promise you that we will sell it within a month or 300 days. There are several aspects that can be said for sure. We run advertising for Russia, the CIS and the whole world. We accept calls 24 hours a day. We sell in Russian and English. We train brokers and keep a complete, up-to-date and pleasant catalog of Moscow penthouses. Dial the project broker or leave the request, and we will call as soon as we get the chance.